My father’s mother was a wonderful cook. She revelled in cooking delicious French and English foods. Sunday lunches tended to centre around divinely roasted joints with superb gravies. She also loved to set all sorts of pleasures in aspic, asparagus being a favourite since the days when she used to have them fresh from her own garden. There’s no doubt she took a huge amount of pride in her cooking and so there was more than a hint of rivalry with my mother. Though I can’t be sure I think more than once she would note down recipes ever so slightly incomplete so that her version would always taste better. She wouldn’t have been the first cook to jealously guard her secrets! One famous family story is of the first Christmas my mother took on cooking duties. Buried in the kitchen for two days my mother wanted to be absolutely certain that she impressed. Being French-Canadian she naturally decided to cook a giant turkey. This was before turkey had become as popular in the UK as it is now. So after some research a beast was procured which had been selected with some considerable deliberation from a specialist farm. On Christmas day my mother was exhausted but proud as she emerged from the kitchen with the huge, golden turkey and placed it on a table laden with stuffing and home-made cranberry sauce. It was at this point that my grandmother made it known that she only ate goose for Christmas.UN peacekeepers nearly had to be called in at this juncture. Goose is still popular in France for Christmas but I’ve not yet had the opportunity to taste it and I certainly never had the courage to ask my mother to cook it. Whatever my mother was cooking I wanted to be involved in the preparation. I don’t know if this began because my hunger drove me to be as close as possible to the food or out of genuine curiosity. One of the first things I was permitted to make was salad dressing as it involved no dangerous implements. My father taught me the dressing his mother had taught him. I fairly sure my grandmother showed me herself a few times also. In fact it’s less of a recipe and more a rule of thumb which leaves great flexibility depending on what will be in the salad and your mood. The only way to mix this sort of dressing is by vigourous shaking so keep an old jam jar for this purpose. 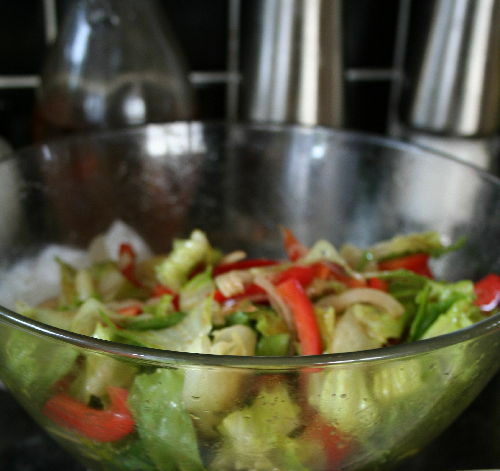 The basic dressing consists of a 3:1 ratio of olive oil to vinegar. This needs to be played with a bit if the vinegar is sharp. I tend to use balsamic or cider vinegar but sherry or red wine vinegars are good too. For every unit of vinegar you want one teaspoon of Dijon mustard. I’ve noticed that some mustards are getting more vinegary so you may need to make adjustments. For every unit of vinegar you also want 1.5-2 teaspoons of sugar or honey depending on your taste. Season with salt and pepper, then shake well. My grandmother often liked to add a dash of Worcester sauce. Freshly crushed garlic is also very welcome in this dressing. Previous PostThe election that wasNext PostSeth Godin’s “Linchpin” – go read it!